This is such a great quote! 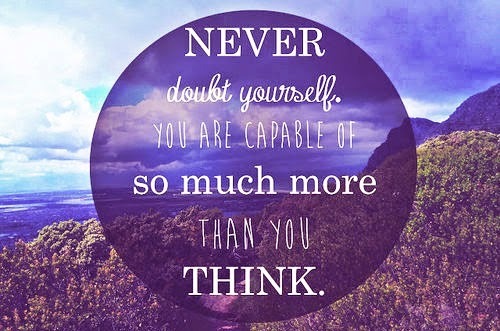 It's all about trusting yourself and believing in yourself. Right now I am recovering from getting my wisdom teeth out. This means bed rest for the next few days, but I still need to keep myself occupied :) While I can't leave my house for the next week, I still want to find some cool things to post about. A few days ago, the lovely Michaela from Monogrammed Midwesterner nominated me for the Liebster Award! She is so kind and has been such a supportive blogger friend :) Everyone check out her blog! 4. Let your nominees know they've been tagged- and no tag-backs! 3. My favorite numbers are 2, 4, and 8. 4. New York City is by far the coolest place I've ever been to. There is always something new to do! The food is incredible and the people dress really nicely. 5. I love different genres of music. From country, to alternative, to rap, I find them all unique & if a song is catchy I will listen to it on repeat. 6. I watch wayy too much reality TV! The Real Housewives and The Kardashians are my favorites. 7. I am Italian and Irish. 8. I eat chicken all the time. It is by far my favorite food! Chick-fil-a is the best. 9. I love bike riding. 11. I love kids! I volunteered with large camps of children during my high school years and always hold a special place for them. My style is a mix of preppy and bohemian. I love a great classic chino and striped shirt combination, but I have a weakness for tribal prints and turquoise! 2. What has been a favorite Halloween costume that you have worn? Hmm, I think it has to be when I was Dorothy from the Wizard of OZ. 3. Which is your favorite season to dress for? I love fall! For the fall i really enjoy wearing boyfriend capris and a light sweater as my go-to favorite. 4. What was the last thing you watched on TV/Netflix? My guilty pleasures are Gossip Girl and The Real Housewives series. I have recently begun re-watching Gossip Girl with my girlfriends and it makes me feel so happy to watch Chuck/Blair Dan/Serena in their budding relationships again. 5. What is the one beauty product you could never live without? This is so tough...probably my Aveeno sunscreen! This product is great because it protects my super fair skin from the sun and it smells so good. 6. What is your favorite sport to watch and/or play? Unfortunately I am not very coordinated when it comes to sports, but I really love watching baseball and football because I get very animated and look crazy but it's normal because so do a lot of people when they watch sports! Mint Chocolate Chip orrrr Cake Batter from Coldstone. 8. If you could meet any fictional character, who would it be? 9. Who is your #1 celebrity crush? Instagram is so much fun. I love photography, following other people for creative inspiration, and sharing my outfit/blog ideas is so easy via Instagram! 11. What has been the best thing about your blog so far? 2. What is your favorite accessory? 7. What sports team(s) do you cheer for? 11. What are your favorite type of flowers?